The beaches of Nantucket are connected by miles of bike trails. (Coastal Living) -- From the simple, sandy shores of Nantucket to the volcanic paths in Maui, these bike trails range from easy to exhilarating, but all reward with sweeping views of the water. You don't have to be an expert cyclist to enjoy the miles of bike trails that lead to sandy beaches on this island. • Dionis Beach: 3.4 miles northwest via Cliff Road to see America's second-oldest light station at Brant Point. • Surfside Beach: 3.5 miles south via Surfside Road. Once on shore, look for seals and unique shells. • Madaket Beach: 6.2 miles west via Madaket Road. Most of the trail weaves inland around sweeping landscapes, flowering shrubs, and homes. • 'Sconset Beach: around 18 miles round-trip via Polpis Road past the Nantucket Life-saving Museum, Sankaty Lighthouse, and cranberry bogs. Quiet, rustic and always green, the San Juan Islands north of Seattle encapsulate the Pacific Northwest's gently rugged natural beauty. A leisurely ride around Lopez, the flattest of the San Juans, often yields wildlife sightings. Circling counterclockwise -- staying on the shore side of the road -- provides the best views. A full circuit clocks in at about 33.5 miles, depending on detours to shops, restaurants, parks and beaches; 888/468-3701 or guidetosanjuans.com. The bicycling craze hit this island a century ago, when Jekyll Island was the exclusive winter playground of Rockefellers, Vanderbilts and their gilded ilk. A loop around the island today extends about 16 miles, mostly on a paved, flat path that runs for long stretches beside the beach. It also wanders past the grand Jekyll Island Club Hotel and some of the showplace "cottages" that survive from the island's posh past; 877/453-5955 or jekyllisland.com. Presque Isle peninsula curls protectively around Erie, Pennsylvania, on the north shore of Lake Erie. A 13.5-mile trail around the park offers lots of picnic areas and other enticing places to rest. Flocks of migrating birds (shorebirds in April) make spring a wonderful time to visit; 814/833-7424 or presqueisle.org. Visiting this 10-mile finger of a barrier island between Barnegat Bay and the Atlantic Ocean amounts to a trip in a time machine. Decades ago, most of the Jersey Shore looked like this -- unspoiled beaches, dunes, wildlife and not a single high-rise. The 8.1-mile, two-lane road saves a nice reward for the end: views across the inlet of Barnegat Lighthouse, known locally as "Old Barney." The park shelters a variety of birds, including a colony of ospreys; 732/793-0506 or njparksandforests.org. Sailboats glide and windsurfers swoop across Corpus Christi Bay near the gray bulk of the aircraft carrier U.S.S. Lexington, now a museum. Shoreline Boulevard/Ocean Drive curves along this pretty vista, running south almost 11 miles from the downtown Bayfront Arts and Science Park to Naval Air Station Corpus Christi. The route, which passes several waterfront parks and some lovely houses, includes a bike lane most of the way; 800/766-2322 or corpuschristi-tx-cvb.org. Some people hate the middle-of-the-night wake-up, the jam-packed van trip up the mountainside, the crowds at the summit, the biting cold and -- depending on their risk tolerance -- the too-slow or too-dangerous pace of the ride itself. Others can't find enough superlatives to describe the awesomeness of an above-the-clouds sunrise followed by a 38-mile, switchback-filled bicycle descent of Haleakala volcano. The 10,023-foot summit does get genuinely cold (windy and between 30 and 60 degrees), but those who pay too much attention to the incredible scenery risk painful wipeouts. On the other hand, how many other rides are downhill all the way? Find an outfitter at 800/464-2924 or gohawaii.com. Eventually, the Florida Keys Overseas Heritage Trail will run more than 106 miles along the islands that dangle in a languid curve from the southern tip of the Florida peninsula. The completed Florida Keys Overseas Heritage Trail will run more than 106 miles along the islands. The segments paved so far (around 61 miles) already provide the perfect way to explore this otherworldly place, so beautiful away from the souvenir shops and strip malls of U.S. 1. Bikers can view the graceful bridges built a century ago for the Florida East Coast Railway and even venture onto the Old Railroad Bridge, which leads to a railroad museum on Pigeon Key. They can poke around alongside the gorgeously blue-green water. On Big Pine Key, they might even see one of the endangered Key deer, a miniature subspecies about the size of a large German shepherd; 305/853-3571 or dep.state.fl.us/gwt/state/keystrail. The incredibly bike-supportive state department of transportation has mapped out the Oregon Coast Bike Route along the state's entire Pacific shoreline. Even better, it has widened shoulders to accommodate bicyclists, especially along the southbound lanes of U.S. 101. That's the side to ride because it offers the best ocean views. There's also usually a tailwind May through October -- though the hills may prove daunting. A fun and easy detour rambles about 20 miles past the shops and restaurants of historic Old Town Bandon and the spectacular sea-stack formations just offshore; 503/986-3555 or oregon.gov. 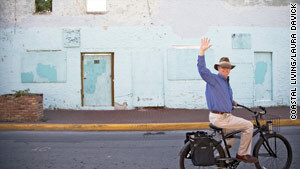 This may be Surf City USA (by official trademark), but the locals like to bike as well. South of Los Angeles in Orange County, an 8.5-mile paved path runs the whole length of the city's beaches, providing continuous views of the Pacific Ocean. Checking out the surfers, joggers, pets, sunbathers, roller skaters and fellow bikers can be fun, too. Outside the city limits, the path extends a mile north to Sunset Beach and nearly three miles south onto the Newport Peninsula for those who want a longer workout. Even city buses promote bicycling -- most sport bike racks on the front; 800/729-6232 or surfcityusa.com. This ride would rank higher if not for wind and traffic. The arrowhead-shape formation of barrier islands, known as the Outer Banks, thrusts way out into the Atlantic Ocean, usually beyond sight of the mainland. These narrow, flat strips of sand afford lots of water views, especially on the Pamlico Sound side. The ride's difficulty depends on whether the capricious sea breezes provide a helpful tailwind or nasty headwind. The main road, two-lane Highway 12, lacks bike lanes or even much in the way of shoulders. Spring provides the best combination of nice weather and light traffic. A 28-mile lighthouse-to-lighthouse ride (plus a free ferry ride in the middle) runs from the famous Hatteras Light on Hatteras Island to the Ocracoke Lighthouse on the western tip of Ocracoke Island; 877/629-4386 or outerbanks.org. Nicknamed the Trail of Conspicuous Consumption, the Lake Trail in Palm Beach, Florida, rolls past some of the swankiest mansions in the world. The easy nine-mile out-and-back ride follows the Intracoastal Waterway on a flat, paved trail near Lake Worth; 800/554-7256 or palmbeachfl.com. On a bicycle built for two, you can easily brave the winds across San Francisco's famous Golden Gate Bridge to Sausalito. Starting from Fisherman's Wharf, follow the bike path to the bridge, which overlooks the city, the Marin Headlands, and the bay. The ride's just under nine miles, and you can return to the wharf via one of Sausalito's two ferries if you prefer to cozy up with your co-pilot instead; 415/332-0505 sausalito.org. Tracing the coastal "thumb" of Michigan's glove, this route rolls past white sugar beaches along the 23-mile Caseville and Lake Huron loop. The journey offers several glute-challenging side trips, such as mountain biking trails in Albert E. Sleeper State Park. With exploring time built in, the loop takes about three hours -- not counting hydration breaks in the many nearby parks and beaches; michiganhighways.org/other/lhct.html. While mom or dad provide the pedal power, kids can marvel at the wildlife along the False Cape Interior Trail at False Cape State Park in Virginia. 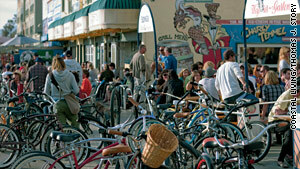 The South Bay Bicycle Trail passes through bustling Venice Beach. To see and be seen, spend an afternoon on the South Bay Bicycle Trail, which stretches from Will Rogers State Beach to Torrance County Beach in Southern California. Along the 22-mile route you'll see loads of sunbathers, weight lifters, and the artsy crowd at Venice Beach; 310/ 305-9503 or parks.ca.gov/?page_id=625. The Cape Cod Rail Trail in southeastern Massachusetts is the ultimate New England experience. 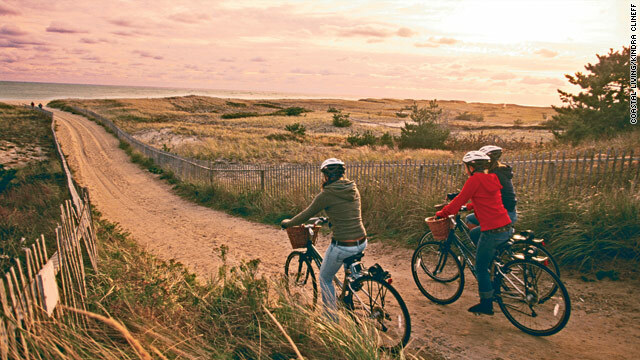 As you ride the 22-mile rail-trail through villages from South Dennis to South Wellfleet, you'll roll past cranberry bogs, beaches, and plenty of places to "pahk" and take leisurely shopping and dining breaks; 508/896-3491 or mass.gov.